You can move or reorder assignments after you've created them. You can manually drag and drop the assignment, or you can use the Move To option, which is also accessible for keyboard users. You can also move all assignments in an assignment group to another assignment group. You can use the drag and drop option to reorder assignments. Click the drag handle next to the assignment name. Drop the assignment in the desired location by releasing the mouse. You can also use the Move To option to reorder an assignment. Click the Options icon  and select the Move To... link . 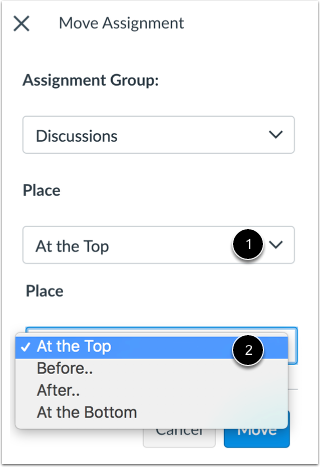 In the Move Assignment sidebar, click the Assignment Group drop-down menu , then select the assignment group for the assignment . 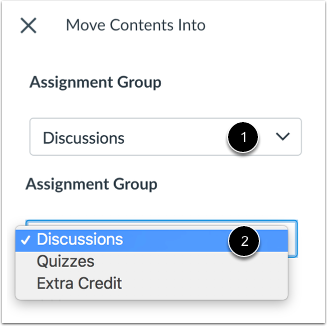 If you want to keep the assignment in the existing assignment group, select the existing assignment group name. However, if you want to move the assignment into another assignment group, select the new assignment group name. In the Place drop-down menu , select the placement of the assignment you are moving. You can move the assignment so that it is at the top of the section, before or after a specific section, or at the bottom of the section . If you selected the Before or After option, click the third drop-down menu . 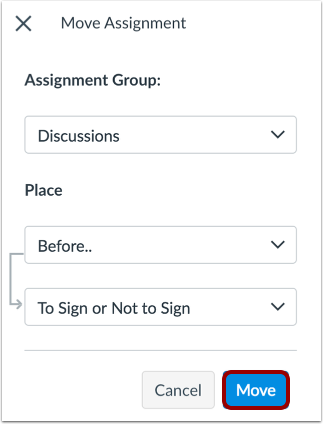 Select the assignment that should be before or after the assignment you are moving . 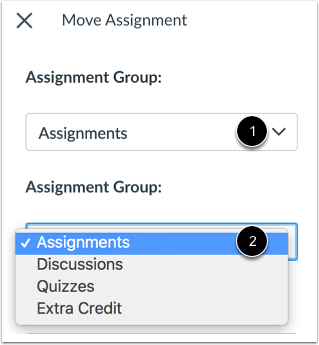 If you want to move all assignments within an assignment group, click the Options icon  and select the Move Contents link . 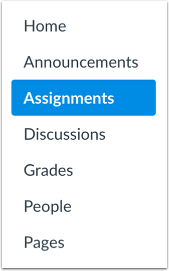 In the Move Contents Into sidebar, click the Assignment Group drop-down menu , then select the assignment group . Note: Choosing a placement for the assignment group contents will place all contents in the same order as they currently exist in the assignment group. 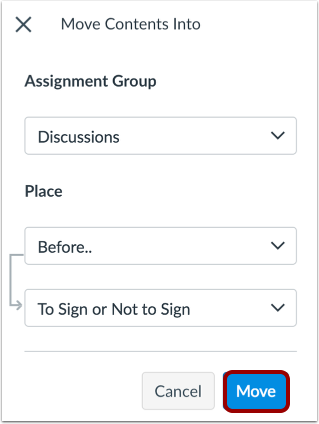 After you have moved the contents, you can reorder assignments within the assignment group individually. In the Place drop-down menu , select the placement of the contents you are moving. 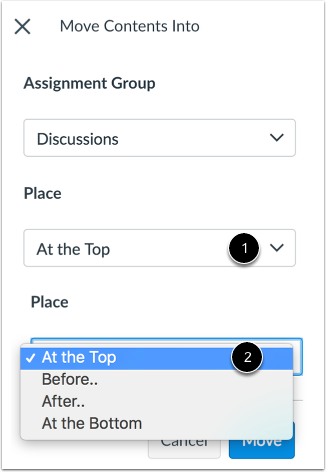 You can move the contents to appear at the top of a new assignment group, before or after specific items within the selected assignment group, or at the bottom of the list of items in the selected assignment group . If you selected the Before or After option, click the third drop-down menu . Select the assignment group content item that should be before or after the contents you are moving . If you want to move the contents to another location, change the sidebar placement options again. Previous Topic:How do I give extra credit in a course? Next Topic:How do I import SCORM files as an assignment? Table of Contents > Assignments > How do I move or reorder an assignment? Re: How can I have all my quizzes worth two points? Re: How do I drop a grade ? Re: How do I group grades?